Writing a update on friend wall, this is the most important part in social networking sites. Famous networking sites are like Facebook and Orkut but people calling different like wall and scrap. Now Twitter testing this feature. I have enable this option in labs.9lessons.info. This post explains you how to design database and table relationships for posting a update on friend wall.. Note: Before reading the post you have to follow my labs.9lessons.info database design previous posts. Data storing like this here password stored in encrypted formate tutorial link. Insert statement for fried wall update here $session_id refers to login user eg:srinivas (1). 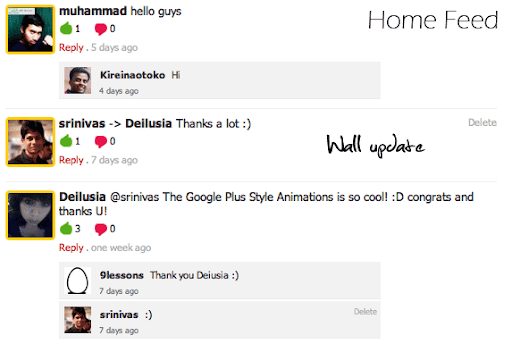 Notice the above table data record update_id=4 Srinivas(user_id_fk=1) post a update on Arnold(owner=2) wall. Data relation between users, updates and friends tables. The following SQL statement users table object a , updates table object b and friends table object c . Here friend_one = '1' refers to users table user_id value. Data relations between users and updates tables. The following SQL statement updates table object a and users table object b ,. Here user_id_fk = '1' refers to users table user_id value. The requested URL /high_cpu.htmlsrinivas was not found on this server. Hi, is it possible to download this script? Can you please tell me where is the friends table? Thank for sharing this, i think this will help many people. Don't copy paste the code if you don't understand it (to readers). how to add friends script?? Is the updates table the same as the comments table? Would be nice to to have files for download. can you make a downloadable of this tutorial please? nice article , user for me. i have one doubt that how i know user is my friend or not. if i send request to my friend then which table of column should be updates so that he is added to my friend list..
please show the friend table also. really good but i have one doubt how to update and insert data using primarykey!